On the Harmful Effects of Tobacco (Russian: О вреде табака, translit. 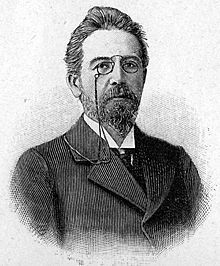 O vredye tabaka) is a one-act play by Anton Chekhov. It has one character, Ivan Ivanovich Nyukhin. First published in 1886, the play was revised by Chekhov and is best known from his 1902 version. This was first published in English in The Unknown Chekhov (1954), a collection of writings. The action takes place in a town hall. Nyukhin has been told by his wife to give a lecture about "the harmful effects of tobacco," although he is a smoker. He emphasizes that this will be a dry and boring lecture, but always postpones the actual subject by talking about his problems with his domineering wife. "I must tell you, by the way, that my wife runs a boarding school. Well, not exactly a boarding school, but something in the nature of one. Just between us, my wife likes to complain about hard times, but she has put away a little nest egg... some forty or fifty thousand rubles. As for me, I haven't a kopek to my name, not a penny... "
"She is here. My wife is there in the wings waiting for me." "If she asks you, please, I beg you, tell her that her scarecrow husband, I mean, the lecturer, me, behaved with dignity." The play was originally published on 17 February 1886 by Peterburgskaya Gazeta, subtitled "The Monologue scene" (Сцена-монолог) and signed A. Chekhonte (А. Чехонте). Later that year, in a revised version it was included into the Moscow-published Motley Stories (Пестрые рассказы) collection. Later Chekhov continued to revise it, until the better-known 1902 version was included into the volume 14 of the Complete Works by A.P. Chekhov published by Adolf Marks in 1903. The first English publication was by Ecco Press in The Unknown Chekhov (1954), a collection of writings. Paul Newman directed a short film adaptation of On The Harmful Effects of Tobacco that received limited screening in New York City in 1962. Nyukhin was played by Michael Strong, who had performed the monologue to high praise in The Actors Studio. Despite a favorable mention in The New York Times, Newman removed his name from the credits for reasons that remain unclear. He gave the sole print to Strong, who kept it until his death in 1980. As of November 2016, Turner Classic Movies plans to air the film in early 2017. The play was also adapted and set to music composed by American Dominick Argento, in his A Water Bird Talk (1974–1976); he also used passages (and images in performance) from Audubon's Birds of America. ^ a b Commentaries to О вреде табака // Чехов А. П. Полное собрание сочинений и писем: В 30 т. Сочинения: В 18 т. / АН СССР. Ин-т мировой лит. им. А. М. Горького. — М.: Наука, 1974—1982. / Т. 13. Пьесы. 1895—1904. — М.: Наука, 1978. — С. 189—194. ^ a b "EXCLUSIVE: Paul Newman's Lost Masterpiece — And How We Rediscovered It". This page was last edited on 31 March 2019, at 17:11 (UTC).